This coprolite has fossilized over millions of years (so don't worry, it doesn't smell anymore). These range in size from 1 - 2" (2.5 - 5 cm). We also offer polished dino dung. 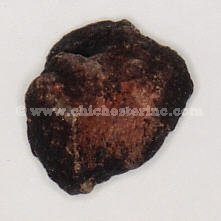 It is the same fossilized coprolite; it ranges in size from 1 - 2" (2.5 - 5 cm). Both rough and polished dino dung are packaged with a card.